Spectra Energy Corp of Houston, Texas, today announced that the company has signed a Project Development Agreement with BG Group PLC, based in the United Kingdom, to jointly develop plans for a natural gas transportation system from northeast B.C. to serve BG Group’s potential liquefied natural gas (LNG) export facility in Prince Rupert. The BG group signed an agreement last February with the Prince Rupert Port Authority for a feasibility study to develop an LNG terminal at the port. A release from Spectra Energy and BG Groupsays each company will initially own a 50 per cent interest in the proposed transportation project. Spectra Energy will be responsible for construction and operation and BG Group has agreed to contract for all of the proposed capacity. The approximately 850-kilometre, large diameter natural gas transportation system will begin in northeast B.C. and end at BG Group’s potential LNG export facility in Prince Rupert. A fact sheet released by Spectra says the project would provide 50 to 60 permanent jobs on completion and about 4,000 jobs during construction. The Spectra BG project will be the fourth using BC’s strategic position on the Great Circle Route to Asia to export liquified natural gas. TransCanada has signed a deal with Shell for a pipeline, Coastal GasLink, that would initially carry up to 1.7-billion cubic feet a day of gas to the Shell Canada project at Kitimat The Pacific Trails pipeline, could carry more than 1-billion cubic feet a day to the KM LNG partners ship where Apache, EOG and Encana are building a terminal at Bish Cove, south of Kitimat. 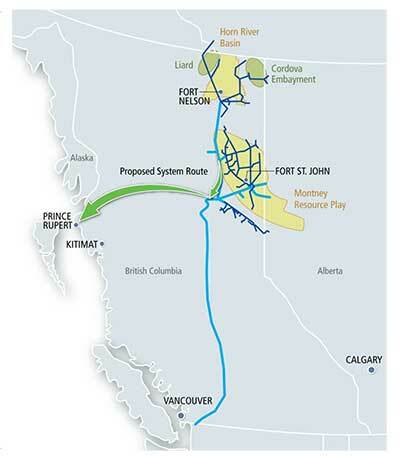 The fourth project, BC LNG, would use either existing pipelines or share one of the proposed Kitimat pipelines to produce LNG for customers at a barge-based floating terminal at what is sometimes called North Cove, between the KM LNG project at Bish Cove and the proposed Enbridge Northern Gateway project which would be close to the Rio Tinto Alcan smelter. The Spectra release says the new transportation system will be capable of transporting up to 4.2 billion cubic feet per day of natural gas. The project will connect with the Spectra Energy facility at Fort St. John, the centre of the still growing shale gas production and exploration in the northeastern BC. We are excited to be partnering with BG Group, a recognized world leader in natural gas and more specifically, LNG. This project offers B.C. a unique opportunity to access new markets, strengthen its energy infrastructure, engage stakeholders in economic growth and job creation, and ultimately secure the province’s position as a competitive energy leader. Furthermore, today’s announcement initiates our next wave of investment opportunity in B.C. We are ideally positioned to create further value for our investors by leveraging surplus B.C. natural gas supplies and facilitating its export to high-demand markets in Asia. This, in turn, will provide multiple opportunities for further investment in our gathering and processing facilities in the province. For more than half a century, Spectra Energy has been a part of communities in B.C. This project will build on our expertise and track record of delivering natural gas responsibly, listening to the needs of Aboriginal and local communities, and protecting the environment, as we help deliver on B.C.’s energy potential. Working together with affected stakeholders and based on preliminary assessments of environmental, historical, cultural and constructability factors, early conceptual routes have been developed. Spectra Energy and BG Group will continue engaging with interested and affected stakeholders, including Aboriginal and local communities, environmental organizations and regulatory agencies, to further refine the project route. As is now common with proposed energy projects for northwestern British Colulmbia, Spectra has set up a website for consultations Energy for BC.